ARCTOSTAPHYLOS UVA-URSI.—Bearberry. Britain. A neat shrub of trailing habit, and with flowers resembling those of the Arbutus, but much smaller. The leaves are entire, dark green in colour, and about an inch long, and obovate or oblong in shape. Fruit globular, of a bright red, smooth and shining. This is a native shrub, being found in Scotland, northern England and Ireland. 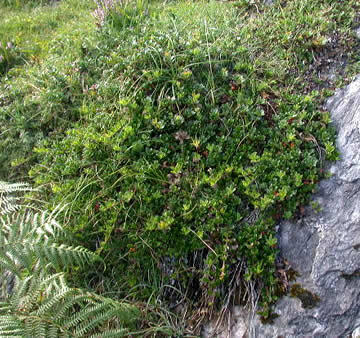 A. ALPINA.—Black Bearberry. Scotland. This is confined to the northern Highlands of Scotland, is of smaller growth, with toothed deciduous leaves, and small drooping flowers of two or three together. Other common names for bearberry – Arctostaphylos uva-ursi – barren myrtle, burren myrtle, bear bilberry, bear’s grape, box-leaved wintergreen, bralins, brawlins, coralberry, creashak, crowberry, dandies, fox plum, ground holly, hog cranberry, kinnikinnik, kinnikinnick, mealberry, mountain box, mountain cranberry, rapper, red bearberry, sandberry, upland cranberry, uvaursi, uva ursi.